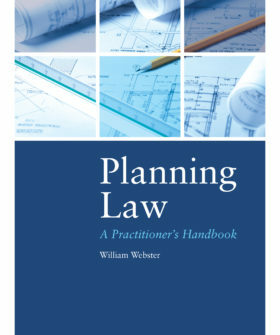 William Webster is to publish a practitioner's handbook for planning professionals this summer. The book covers the widest possible range of planning topics in a single volume. It is written for planning practitioners in the private and public sectors. It will contain the final revisions to the National Planning Policy Framework (NPPF) which is due to be published in Summer 2018. The book is written in a style that combines a readily accessible narrative with a substantial body of footnotes for those looking for more detail when it comes to case law and statutory materials. Planning Law: A Practitioner’s Handbook will provide answers for the busy planning professional to a whole range of problems which commonly arise in the day-to-day practice of planning practitioners in either the private or public sectors. Its advantage lies in the fact that it is a single up–to-date reference book covering a broad range of topics which might otherwise only be found in a number of specialist texts. Keeping pace with planning law is no easy matter. As everyone knows, the basis of development control is that planning permission is required for the development of land, whether it be operational development or making any material change in the use of any buildings or other land. The mass of primary and secondary legislation in this field, allied to local and national policy and guidance, make this the most intensively regulated area of the law where, all too quickly, the law, procedure and policy can change. Keeping up-to-date is the priority and this book aims to achieve this in the various fields which it covers. The government’s aim is to accelerate the delivery of good quality housing and to make the planning processes simpler and quicker. Whether this is achievable, and whether the recent reforms will bring about an end to years of undersupply in the housing market, remains to be seen. The book is to be published by Wildy, Simmonds and Hill Publishing.